“My work is an investigation of the aesthetics of power and how the rationalization of the body through vision technologies helps to ratify state, police, and military power. Arguably the most ubiquitous of these technologies is the surveillance camera. I consider this device to be a ‘selfish’ object., selfish because the internalization of surveillance produces the behavior which justifies the installation of the cameras in the first place. As a subject internalizes the culture of surveillance they begin to feel objectified and in turn objectify others. This objectification produces the antisocial conditions, which make it possible to walk into a school and emotionlessly riddle the bodies of your classmates with bullets. This of course is an oversimplification, however, as the Stanford Prison Experiment demonstrated we should not underestimate the power of context. There are overcrowded prisons all over this country, employing police officers, disciplinary officials, metal detectors and millions of dollars of surveillance equipment. At five years old we send our children in for 8 hours a day 9 months a year. 13 years later they come out, and we wonder what happened. “Nothing much happened today” is a work, which investigates the dehumanizing effects of surveillance technology. Eric and Dylan in someway were enacting the very behavior their prison-like high school expected of them. And what did WE do after this incident? We made the conditions for our nations student-inmates even worse! I am interested in how the cross stitch relates to domesticity as well as being an analog version of pixilization. There is also an exploration of time in the work. 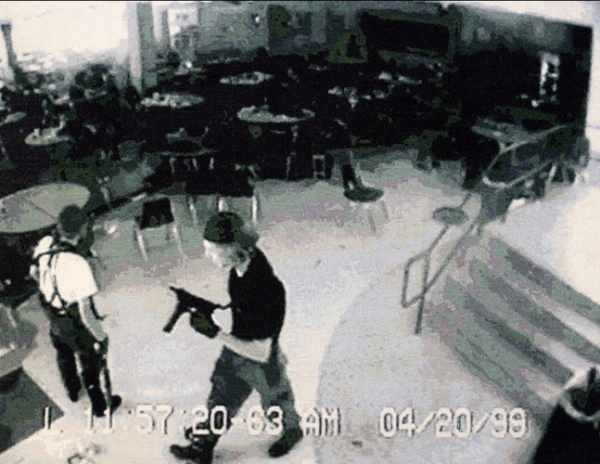 The iconic image represents 1/30 of a second of the event at Columbine. This 1/30 of a second became something much larger and memorable—a kind of evidence. The process of cross-stitch is slow/calculated/conservative in contradistinction to the liberal/messy/disposable character of surveillance video. I am primarily interested in how we are manipulated by not only the content of the media spectacle but also the medium of computer/television screens. By changing the form of content and the spectators spatial relationship to content, I de-editorialize the images that I use. This unpackaging provides an alternative space for contemplation of specific events and destabilized the media spin.